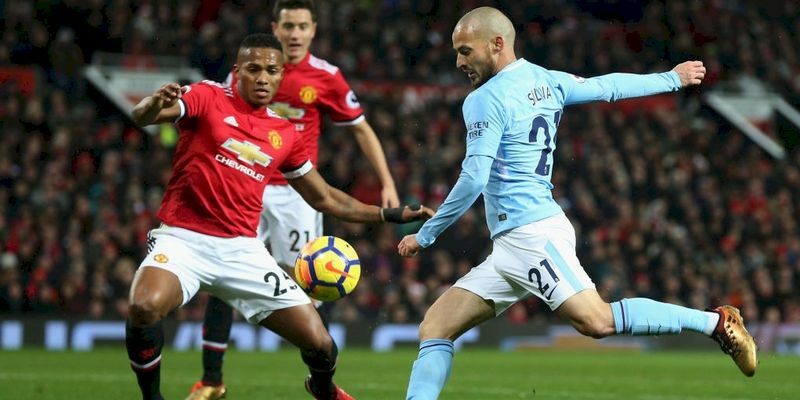 Manchester United’s defensive problems gifted derby rivals Manchester City a 2-1 victory on Sunday that allowed the latter to establish a massive 11-point lead in the Premier League. In the Merseyside derby, Wayne Rooney’s late penalty earned Everton a 1-1 draw with Liverpool at Anfield. City took the lead in the 43rd minute of the game when David Silva hooked home from close range after Romelu Lukaku misjudged his header from a corner in the six-yard box. The goal seemed to wake up United suddenly as they snatched an equalizer in the first-half injury time when Marcus Rashford pounced on Fabian Delph's failure to clear the ball and slotted home from 12 yards out. However, the Premier League table leaders regained their lead nine minutes into the second half in almost similar fashion as of the opening goal. Lukaku's attempted clearance from Silva's free-kick went straight at Chris Smalling and fell for Otamendi, who steered the ball into the net in what turned to be the winner. City were also the last team to emerge victorious at Old Trafford, winning 2-1 in Pep Guardiola’s first Manchester derby in September 2016. Liverpool dominated the first half altogether and didn’t allow Everton to pose any attacking threat and deservingly, took the lead through Mohamed Salah's sublime curling finish from an angle towards the end of the first half. Liverpool should have been two goals ahead of the break when Sadio Mane stole the ball and found himself through on goal. However, the Senegal forward dragged his shot wide when he could have passed for a tap-in. In the second half, with Jurgen Klopp’s side still not able to penetrate the Everton backline, Rooney found the perfect chance to score his first goal in a Merseyside derby as he thrashed a spot-kick past Simon Mignolet for his fifth goal in his last six Premier League starts against the Reds. After the draw, Liverpool remain at the fourth on the Premier League table, two points behind third-placed Chelsea, while Everton stay at the 10th. Charlie Austin fired an early opener for Mauricio Pellegrino's hosts – his fifth in three Premier League starts this season – when Per Mertesacker cleared the ball straight to Dusan Tadic and his slip allowed Austin enough space to control the pass and give an unerring finish past veteran goalkeeper Petr Cech. After that, Arsenal looked to have run out of ideas and a second successive Premier League defeat seemed inevitable. However, fortunately for the Arsene Wenger-managed side, France striker Olivier Giroud conjured a goal with two minutes left when he directed Alexis Sanchez's cross past Fraser Forster shortly after appearing as a substitute. The result meant Arsenal missed out on the opportunity to replace Liverpool in the top four.